Click the chart to track shares of Apple. Apple may have created two new iPhones, but the latest models weren't enough to impress investors and analysts. Shares of Apple (AAPL) tumbled more than 5% Wednesday. That drop, combined Tuesday's 2% slide in the stock, has erased nearly $35 billion in Apple's market value. While Apple shares typically end up lower a month after the release of a new iPhone, a sharp and immediate decline is rare. Following previous debuts, Apple's stock has initially gained ground before moving lower amid fading enthusiasm. 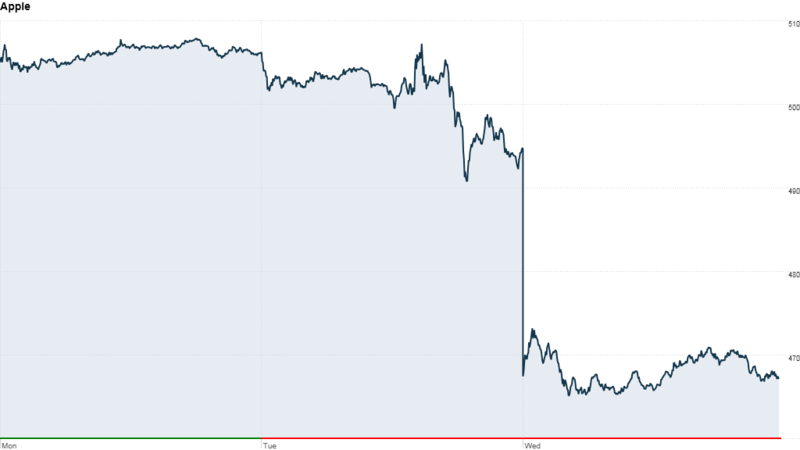 With Wednesday's tumble, the stock is now trading below where it was just before activist investor Carl Icahn tweeted that he has taken a "large" position in Apple. Icahn wants the company to use its $147 billion in cash to buy back more shares. Apple unveiled a new flagship iPhone 5S Tuesday that will cost $649 contract-free. It also debuted the iPhone 5C, a colorful and plastic iteration of the device, at $549 without a contract. 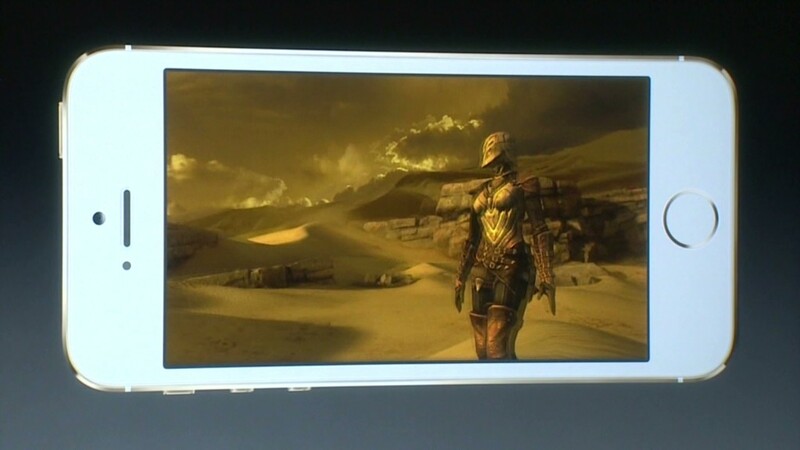 But there were no surprises in the iPhone announcements. And analysts think the price differential between the two new products may not be enough. Analysts at Bank of America, UBS and Credit Suisse all downgraded the stock to "neutral" Wednesday morning, citing concerns about the lack of innovation and the pricing. While the iPhone 5S has a new processor, an improved camera and a fingerprint scanner, Credit Suisse analyst Kulbinder Garcha said the new features "are not game changers and are more evolutionary rather than revolutionary." "The slower rate of innovation comes at a time when high-end smartphone competition will remain intense from Samsung and others," he added. And even though the iPhone 5C was introduced as a lower-cost device, Garcha said its price is not low enough to help Apple gain ground in the lower-tier smartphone segment, an area where devices from Samsung and others that run on Google's (GOOG) Android dominate. While Apple's decision to remain a premium priced smartphone company may be good for profits, it won't be for growth, Garcha noted, adding that he expects Apple to continue losing market share to Android. UBS analyst Steven Milunovich said he is concerned that the meager $100 difference will particularly hurt Apple's ability to be competitive in key growth markets like China. Apple did announce it has cleared the final regulatory hurdle required to run the iPhone on China Mobile's cellular network, the world's largest carrier. But analysts were expecting Apple to announce a deal with China Mobile (CHL) that would have allowed them to start selling the phone immediately. Milunovich said even if Apple secures a partnership with China Mobile in the near future, it will be challenged to compete against the comparable devices that run Google's (GOOG) Android and are priced 40% to 50% below the iPhone 5C. Though hopes for the new iPhones are low, analysts don't seem to think the stock will fall much further. Milunovich lowered his price target on Apple to $520 from $560. But that's still up 11% from current levels. Bank of America analyst Scott Craig held his price target on the stock also at $520 per share, highlighting Apple's low valuation. And when Icahn announced his Apple investment last month, he tweeted that the company is "extremely undervalued." With the recent dip, shares of Apple are trading at less than 11 times fiscal 2014 earnings estimates. In comparison, Google shares are trading at almost 18 times profit forecasts for next year. A handful of analysts, including Canaccord Genuity's Michael Walkey, raised their price target on Apple shares Wednesday. Walkley, who boosted his target to $550 from $530, said he thinks the new iPhone 5S will be "very competitive" against leading Android smartphones. Walkley also noted that Apple's aggressive plan to launch the iPhone 5S and the iPhone 5C in more than 100 countries by the end of the year will help lift the stock. But even if shares climb back to $550, that would still be more than 20% below the all-time high of $705 that Apple reached last year just after the iPhone 5 was unveiled.